Alypso Plus contains a naturally-derived surfactant that reduces the surface tension of water and improves the infiltration of rainfall and irrigation into and throughout the turf or plant root zone. The water conditioner in Alypso Plus reduces pH and addresses issues associated with poor water quality. Alypso Plus may be used in conjunction with other soil surfactants, plant protectants or plant nutrients. * California, Washington and Canada: Use only as labeled in respective state/country. See labels and literature in “Resources” section. 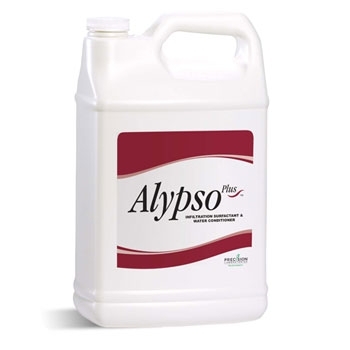 Inject 32 ounces (946 ml) of ALYPSO PLUS per one acre (.40 ha) of turfgrass or ornamentals. Spray 32 ounces (946 ml) of ALYPSO PLUS in a minimum of 60 gallons (227 L) of water to treat one acre (.40 ha) of turfgrass or ornamentals.